Indiana will look to snap a two-game losing streak when it hosts Nebraska on Monday evening at Simon Skjodt Assembly Hall. The Cornhuskers are 12-4 overall and 2-3 in Big Ten play. Indiana blew an opportunity to record its second Big Ten road win on Friday night at the XFinity Center as the Hoosiers led by 14 in the first half, but collapsed in the second half and fell 78-75 to Maryland. But as Archie Miller said on Friday night in the aftermath of the loss in College Park, the Hoosiers have to move on quickly and find a way to bounce back on their home floor. This unrelenting stretch of games for Indiana, which includes six of eight on the road, continues with a talented Nebraska team right in the mix for an NCAA tournament bid. The Huskers boast one of the Big Ten’s best starting fives, but like Indiana, have little depth. Nebraska is just 3-4 in games away from Pinnacle Bank Arena this season and 1-3 in true road games. Senior guard James Palmer Jr. is an elite scorer and rarely comes off the floor for Tim Miles. Palmer Jr. is playing 94.5 percent of available minutes through five league games and is averaging 18.2 points in conference play. While the overall body of work for Palmer Jr. in terms of efficiency is strong, he’s been high usage, low efficiency in Big Ten competition. Palmer Jr. is shooting just 31.9 percent overall against Big Ten opponents (33.3 percent on 2s and 30.3 percent on 3s). According to Synergy Sports, Palmer Jr. has been at his best this season as the ball handler in pick-and-roll situations. He’s scoring .95 points per possession in those situations, which ranks in the 82nd percentile nationally. Palmer is an attacking scorer who currently boasts the sixth best free throw rate (FTA/FGA) in conference play. He’s shooting 79.3 percent overall on free throws for the season on 121 attempts. Palmer Jr. is joined in the Nebraska backcourt by senior point guard Glynn Watson. The Illinois native has been stellar in league play as his assist rate of 23.5 percent is ninth best in the league and he’s shooting 57.1 percent on 2s and 36.4 percent on 3s. His 13 points per game are fourth on the team against Big Ten foes. According to Synergy, Watson is an excellent transition player (1.42 PPP) and also excels as the ball handler in pick-and-rolls. Watson’s 1.07 points per possession as the ball handler in pick-and-roll ranks in the 92nd percentile nationally. 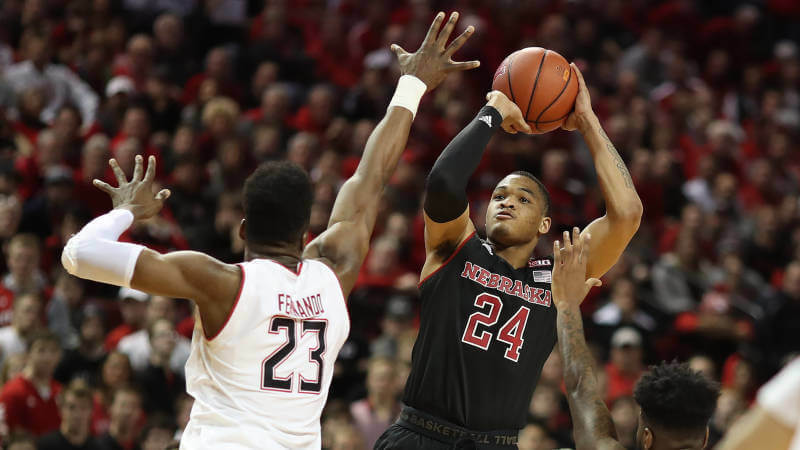 Sophomore guard Thomas Allen turned down Kansas out of high school to play for Nebraska and after limited minutes as a freshman, he’s now a starter playing major minutes. He’s a career 36.2 percent 3-point shooter who is above average in spot up situations. Allen’s 1.08 points per possession on spot ups ranks in the 76th percentile nationally, per Synergy. Junior forward Isaiah Roby is on the NBA radar because of his size, athleticism and versatility. The 6-foot-8, 230 pound Roby is shooting a stellar 57.4 percent from the field in Big Ten play and is averaging 14.6 points against league opponents. Roby is an above the rim finisher who can also defend at a high level. He’s eighth so far in Big Ten play in block percentage and 16th in steal percentage. Sophomore wing Nana Akenten plays the majority of the backup wing/frontcourt minutes and is a stellar 3-point shooter (39.6 percent). In Nebraska’s last game, a 70-64 win over Penn State, Akenten was the only non-starter to log more than four minutes of action. Redshirt senior Isaac Copeland is Nebraska’s five-man and the 23-year old is the team’s second leading scorer (14.3 ppg) and rebounder (5.3 rpg). Copeland is 6-foot-9 and 225 pounds, so he won’t present a huge size mismatch for Juwan Morgan. He’s been very efficient in league play at 43.8 percent on 3s and 55.3 percent on 2s. He’s most dangerous as a jump shooter and offensive rebounder and isn’t a traditional back to the basket big man. Nebraska and Indiana are both running at about even in Big Ten only efficiency margin, but the Hoosiers have won with defense and the Cornhuskers have earned their two wins with stellar offense. Both teams are well below average on the glass so far in league play and generate a solid amount of offense by getting to the foul line. Indiana has been excellent in terms of taking care of the ball its last two games and it’s a trend the Hoosiers will need to continue on Monday. Nebraska is currently third in defensive turnover percentage in conference games. The Vegas line won’t be out until later on Sunday, but both KenPom and Sagarin like Indiana by 2 on its home floor. Nebraska owns two wins over Indiana in Bloomington since joining the conference (March 2014 and December 2016). While the Huskers are just 1-3 in true road games this season, their losses have all been respectable (by 7 at Minnesota, by 2 at Maryland and by 9 at Iowa). Indiana’s defense has been an issue the last two games as the Hoosiers surrendered 1.21 points per possession to Michigan and 1.26 to Maryland. Those are Indiana’s two worst performances of the season to date defensively. Nebraska presents another challenge for the Indiana defense, which has only allowed a point per possession once on its home floor this season (Louisville). Ultimately, this game will likely come down to whether Indiana’s defense can return to the form that it has exhibited for most of the season, but has gotten away from the last two games.